So, I asked Herr what of the resolutions I should make the official one. He decided leading a more active lifestyle would lead to the other ones (and honestly, I am getting the lethargic I-sit-at-a-desk-all-day body shape), so now I am supposed to be leading a more active lifestyle. I started out walking the dogs right before we got major snow and ice problems and could not safely continue doing so (getting pulled by dogs on ice equals big ouchies). We are also performing in musicals, and that keeps us pretty busy. We are building a gym and music studio now, and we’ve both taken exercising very seriously. I do it right away in the morning so I can continue to sleep while I do stretches. 😛 Hey, it works well! New Years Day was slated for a full day in Zurich. However, when we got downtown, it was more like a ghost town. Everything was closed (they even had posters everywhere stating it). It made me horribly depressed; it looked like it would have been a lot of fun to spend a day hanging around the shops. Herr attempted to cheer me up by walking around the lake, but it was such a dreary grey and windy day, we ended up back at the hotel two hours later. So the first day of the new year, I spent watching movies on the tv and just relaxing. Herr left for a few hours to take photos of trains and visit the empty campus of ETH (where Einstein went to school), and later we went for another swim up in the pool (did I mention the views?). All in all, it was best for me to have a day of relaxing, and even though I was still sad about everything being closed, I felt a lot better. Herr really wanted to go to Konstanz, and I wanted to go to Rhine Falls, so our goal was to get them both in today. It took us a while to find Lake Konstanz, but when we did it was great. The sky had cleared up, and it was a true port area with port entries and docks with boats. We couldn’t find the catamaran that was still in service at first, but as soon as we sat down at a fantastic restaurant on the pier we spotted one coming in. The restaurant had fantastic Mediterannean/Asian cuisine; I had a potato pear soup and Herr enjoyed a delicious Asain noodle dish (I helped him with it :P). We hopped on the catamaran for a 50 minute trip to the other side of the lake where the Zeppelin Museum is. We walked inside a Hindenburg replica and saw other aircraft/blimp/car related Zeppelin things but just missed the trip back we were supposed to take to Konstanz. We ended up stopping by an ice cream shop and having a fancy kiwi sundae as we waited for the next catamaran, but it was already getting too dark to go to the falls. We just headed back to the hotel and planned to see the falls the next day. Our last day in Switzerland, Herr had originally planned to drive three hours south to go up the mountain to Zermatt, where the Matterhorn is visible. The skies were bright and sunny, and at the last minute, instead of taking it easy and swinging by the falls, we turned around to the mountains. Unfortunately, the farther south we went, the cloudier it got. We eventually found the base of the peak with another pseudo rack railway that could take us to Zermatt. Now, I should say, none of this was free; going up a mountain is horribly expensive. So I was pretty grumpy when we got on the train. Zermatt is an interesting town in that no personal vehicles exist. There are mini hotel vehicle things, but you really just walk everywhere. Even as far up in the mountains as we were, the Matterhorn disappeared into foggy clouds. We saw the base of the craggy peak, but not the entire mountain. It was a bit disheartening. As we waited for the train to take us back down the mountain, we stopped for a bit of cheese fondue. It seemed fitting to have our last meal be cheesy. 😉 The drive back (thank goodness the auto train was still operating at 6 p.m. on a Sunday!) took about five hours. In hindsight, we really should have gone to the falls, or just one of the mountain peaks. We are planning a trip to Austria later this year and have agreed we’d take the long way home through Switzerland so I can see the falls, and maybe even the ice caves (or regular caves), the two things I really wanted to do in Switzerland. 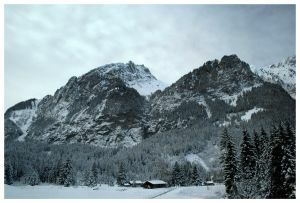 We spent five days in Switzerland around the New Year as a last minute get away to relieve stress. I have been incredibly stressed at work, without breaks and mountains of work to do as others took vacation or were on the road to meet a tight deadline. Regardless, I was past breaking point. Our original plan was to go to Iceland and stay at the spa, hang out in the Blue Lagoon, but airfare is horrendous. That canceled, we were going to stay home; then we decided a getaway was necessary. After picking up the Ford Fiesta, we ran the dogs over to the kennel (it was so sad! ), then south we went. We stopped just inside the Swiss border at the town of Basel for lunch at the train station, which is when we found out how expensive it was to eat. The Swiss Franc is only a little stronger than the U.S. dollar, which is at least better than the euro. We took a circuitous route farther into the countryside, tunneling through mountains, crisscrossing up them, and eventually driving up and along a narrow serpentine cliff-like road (with no guard rails!) before reaching our destination: the Emmantal dairy farm. Switzerland is known for its cheese and chocolate (and watches), and Emmantaler is one of the four main cheeses. It also happens to have an open floor plan for visitors to watch the cheese action live. It was worth seeing. Afterward, we left for Zurich. We were upgraded to business room at the hotel, then went to the hotel restaurant for dinner. I really like pumpkin risotto. 😀 A little after dinner, we had massages at the wellness center on the top floor, where the pool and exercise rooms are also located. All the rooms had a great view of the city, but I highly recommend NOT getting massages. They were okay, but the cost two or three times more than a normal spa. It was ridiculous; just go to Baden Baden. We spent most of New Years Eve in Lucerne. The city is gorgeous, with the Alps hemming it and a huge lake. There’s also a great shopping district we wandered through after checking out the infamous water bridge (it burned back in 1993 after standing for 500 years) and water tower. It felt great to be walking along the water front, and the birds were amusing to watch. The only problem with our itinerary was the running around we did on the peak made me dizzy and lightheaded, so when we returned to Zurich, I had no energy to go out to the New Year celebrations going on downtown. I wish we could have, from what we heard it was quite a party along the lake with live music and fireworks. As it was, we watched fireworks go off in different cities around the world in the comfort of the hotel room. I know, sad, but lesson learned; do not run around the peaks of the Alps (at least if you want to do something later). I realize I never posted how I did with National Novel Writing Month in November. I finally got a good technique down for writing. I was hopeful to continue writing after November because I have a good plot going, but I got some major curveballs. I opened my Christmas gift a month early so I could perform in Oliver! the musical. Herr purchased a full electric drum set, and less than a week later I was playing for the opening. To say the least, it was extremely stressful. We start up with performances again this Friday. At work I was also stressed with too many projects and no one around. That means even more work for me. So when I did have time off, I didn’t do much. I got fat though, oh boy… stress eating and holidays, not a good combination! In any case, my story was much more successful than last year with nearly 11,000 words in one month! I am not certain of the title, but for now it is “The Sensitives: Case of the Unfortunate Daughter.” Think of it as a Nancy Drew, Hardy Boys, Bobbsey Twins meets paranormal ghost hunting, detective work, and mystery (for teens). Set in 1904 on the East Coast with a wide range of characters. I will load what I have to the Web site, and I will hopefully continue writing soon, now that Oliver! performances end this month. Herr has a main part in the musical Cats! this March, and we may be playing in the orchestra for Little Shop of Horrors (at least I’ll get some good practice with the drums before then). However, we are hoping to make this a year of travel, and do have some plans starting to take shape.